A to C (ascending) is always a third. Whatever the A is; whatever the C is. So, A to C is a third, but what kind of third? 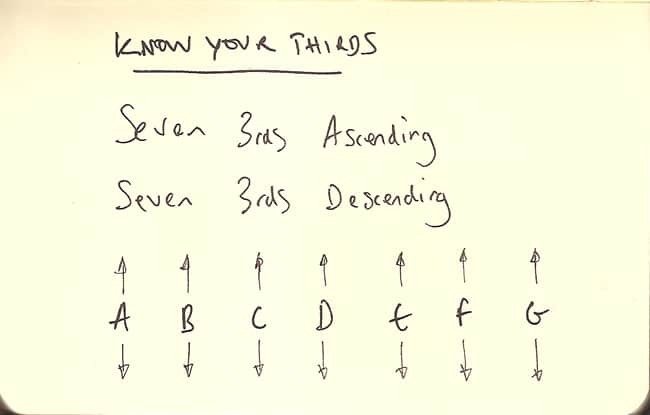 Knowing how to notate thirds accurately, (and other intervals) depends on upon your knowledge of the major scale. If you know that in every key, then you’ll be able to name the intervals correctly. Anyway, hopefully, you’ll be able to see that A to C of any kind is a third. A to B is not, and never will be, a third. It is, and always will be, a second (of some type). Don’t fall into the trap of calling, say, C# to F a third. You mean Db to F. It’s a super common error amongst guitarists. Because of TAB, of relying on shapes and not thinking about the notes. Say you’ve got these notes: C# F Ab C.
You can run into all kinds of bother trying to label a chord when you’ve spelt a note incorrectly. The C# should be Db. Then you can see that it’s a bunch of 3rds and all is well with the universe. Anyhow, the point of this is to know those 7 thirds at the beginning of the lesson. That’s a HUGE HUGE key to understanding harmony and everything.